Results are published here in date order, latest at the top. If you have any results to add, please email the webmaster (see contact us page). It was a good day for a run. Not wet. Not too cold. And the exercise did wonders for curing the after effects of the Brockenhurst Chapter dinner dance the night before. Well done all and especially those who came in fancy dress. For those as don't know, first there's a fun run for the kids, then the handicap. It is a 4 lap run totalling 9.8K. Part way round there was a decorated Christmas tree which was a lovely touch (thanks Linda). You predict your time and the person closest to the predicted time wins. You start slowest first according to handicap so, at least in theory, everyone finishes at the same time which makes the timekeeper's job more interesting. Then there's an opportunity for a drop of mulled wine and a mince pie before heading off to the Forest Home. And the winner was ..... long pause .... more long pause .... Mark Stileman who was only 4 seconds slower than his predicted time of 38 mins. The full results are on an Excel spreadsheet (71K) which you can see here. Thanks go to all who helped make the event such a success. Mick's comment was, "The most frustrating set of results that I've ever had to pull together and if it hadn't been for 30+ manual times/names that I scribbled down I would have given up for the first time!" Luckily he and Brendan succeeded. If you think any corrections are needed please contact Mick (see Contact us tab). It was VERY muddy and cold, but fun. Lots of marshalling santas. Here are the Hardley results. Well done all and especially the ladies for 1st and 2nd. Full results are on the CC6 site (see Links tab). Two Hardley Runners went to New York this year. It was an excellent weekend though getting up at 3am and having to wait over four hours in a cold windy car park before the start were drawbacks! The plan was to run together and finish in 3.56. Jane did it brilliantly. Jeremy suffered a pulled hamstring muscle (biceps femoris for the technically minded) and had to slow down dramatically from mile 17. Picture report follows. an intriguing comment from Barb Clarke, "The leg's much better today - just a bit stiff and turning a rather attractive range of colours." There must be a story there somewhere. For more information and the full results see the race website. Lots more people chose The Stickler. Could it be the huge price of the GSR? Or the crowds? Or the staggered start? Anyway, well done to those who went. Hope you got a glimpse of Paula doing her stuff. Jane and I look forward to seeing her in New York on Sunday. Another good turnout for the Dorset Three Peaks. There was an excellent Hardley turnout for the first CC6. Well done all! Hardley results were as follows. You can see the full results on the CC6 website (see Links tab). Finished 10th (out of 10) in Vet Men Division 1. Well done to all the members who braved poor conditions for this year's event. You can see the full results here. At the same time as the New Forest races (see below) other Hardley members were enjoyng the Stanstead Park Slug (8m) and Slog (13M). Martin says, " glorious off-road running over the South Downs - much cheaper run than the new forest and much easier on the knees". It was a lovely day for the New Forest half and full marathons and the warm weather made the Ringwood Best seem even better afterwards. In you webmaster's opinion, the new course was an improvement as it cut out a nasty hill and saved battling with (understandably) irate caravanners for space on the road through Sway. The start was a bit delayed and the mile markers which were correct for the full marathon also used for the half where they were 192 yards short from mile 4 which was a bit confusing. But overall a very good race. You can see the full results here half and full. Congratulations to Malc Renyard who was first V60 in the half. Martin says, " Studland Stampede - 12k of trails and sand with a finishing stretch of 2miles of beach running (yep, including straight through the middle of the naturists portion of the beach). It was a fine afternoon for the Overton 5, the first race in this season's HRRL. The Hardley results are below. Hard luck Claire! 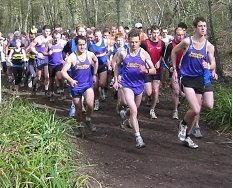 For the full results see the Overton Harriers site and for the latest in the HRRL see their site (link on Links page). There was a good Hardley turnout for The Beast. Your webmaster's party arrived over an hour and a half early as none of the anticipated traffic problems materialised. Such is the dedication of Hardley Runners. It was warm and humid which could have been a lot worse. Had it rained it would have been very slippy in places. The cooling breeze on the cliff tops was bliss. The size of the First Aid tent was more than a bit daunting but the run turned out to be better than expected and the gentle grassy downwards slope in the last couple of miles was lovely. The famous steps were challenging but the good news was that everyone slowed down. Mr Lawrenson developed a new overtaking technique by falling over on the downwards steps and rolling past the competition; an adventure from which he escaped unscathed. The only real drawback was the queues for stiles but that gave a welcome opportunity for a rest from time to time. Thanks very much to our Poole AC colleagues for an excellent event. Here are the Hardley results. And here, with thanks to Caroline's partner, Glyn, are a selection of Hardley photos. Mick Anglim has done it again. This time at the World Long Distance Duathlon Championships at Geel in Belgium on 10 August 2008. Mick took the gold medal in the Men 60-64 category. The distances and Mick's times were were run 18K (78.11) then bike 74K (128.01) and run 9K (42.03). Mick took a clear lead on the first run and increased it on the bike. He lost a couple of minutes on the second run and finished over 4 minutes ahead of the field. Well done. Here's a link to the Belgian website with the full results and background information. The poor weather and the holiday season kept numbers down a bit but it cleared by the end of the race which was a good one and an excellent end to an excellent season. Well done to all who have taken part and especially to the people who turned out for most or all of the races. Here are the Hardley results. The full results will be on the RR10 site from Thursday evening. After the appaling recent weather competitors were quite surprised to find that it was a hot morning with occasional shade from the trees along the route. The race was well marshalled with lots of good support along the route. Here are the Hardley results. Well done to Malc Renyard who was 17th overall and first V60. You can see the full results here. And here's a small album of pictures Peter took. Where were the men? A bit humid, a bit hilly, and a bit slippy underfoot but a good race nonetheless and a good Hardley turnout. Well done all. Here are some pix taken by Anne and Peter. The Hardley results are below. The full results should be on the RR10 site (see Links tab) on Thursday evening. The next and last in the series is Hursley on Weds 20 August. Details on the events page. Remember it starts at 7.15 not 7.30. It was a lovely evening if a little too warm and humid and a lovely course if a little (nay, a lot) too undulating. Afterwards the George and Dragon at Brook had no food even though we had booked a table but we fared much better at the Bell. Here's an album of Hardly pix. Most were taken on the final hill. It looks flat on the pictures but the look on the faces of the runners shows it was not. And here are the Hardley results. You should be able to see the full results on the RR10 site (see Links page) on Thursday evening. Turnout was down on one of the wettest days for a long time. Well done to the hardy Hardley people who came. Luckily the rain eased off for the race and the conditions underfoot were not too bad. We welcomed three new men, Paul Ashley (who was first Hardley finisher - well done! ), John Robson and Andy Smith (not to be confused with Andrew Smith). Here are the Hardley results. The full results are on the RR10 site (see Links tab). The men are now joint sixth and the women joint fifth. And here's Linda's turnout chart. Thanks very much to everyone who helped. As we were the hosts there are no Hardley results so I've put the report and pictures under News. Here's Linda's turnout chart. Thanks to everyone who took part in the above event on a cold and windy night. Thanks especially to Southampton Running Club and Malcom Price and Eryl Penney in particular for hosting the event and arranging for the unusual 800m course to be marked out. Although it may have been a little more difficult to assess the right pace on the longer laps it did result in less congestion at the change over point at which there was no serious congestion (despite some people not knowing left from right!). Congratulations to Team Southampton 'A' for setting the fastest time but congratulations also to all the teams and particularly the three all ladies teams and the Junior team from New Forest Runners. There was a good atmosphere and plenty of team spirit on such a chilly night. We can hopefully look forward to a warmer evening next year when Team Southampton host the event as a reward for winning! You can see the full results here (Excel spreadsheet135K). a link to loads of pix taken by our Eastleigh hosts to whom many thanks for an excellent race. The next race is ours on Weds 25 June. We need all the help we can get with marshalling. This is our opportunity to give something back and say thank you to the countless volunteers who have marshalled other races. Thanks to everyone who has already volunteered. If you haven't quite got round to it yet please contact Paul Blundell and let him know you can help so we can get to make sure that our race is a big success.Thanks. This race was the Hardley Club Championships. It was a very warm morning and the way the course went downhill from 1K to 5K was quite worrying when you think that what goes down has to go up. But all in all it was an excellent race. Hardley results are here. You can see the full results here. Winchester AC have also published a large album of excellent pictures. History will record this as the race when John Simmonds had a close encounter with a Highland cow. Hope you are ok, John. Daniel Powell left some running trousers at the start but when he came to collect them, his were gone but another pair left. Could you all please check you picked up the right kit and email Paul Blundell if you think you have the wrong pair. Ian Berry of Winchester AC took loads of excellent pictures which you can see here. The next RR10 is on 21 May at Wilverley. Please come if you can. It is an excellent course. There was an excellent turnout on a lovely Spring evening for the first RR10 at Netley. The only drawbacks were that the loos were closed and the ground was too hard to put up our lovely new banner. The course was extended to included a diversion to the cemetery but we all managed to make it back to the finish. Here are some photographs. Results are published are on the RR10 site (see links page). Our Chairman, Mick Anglim has done it again! This time he has taken gold in the M60 in the British Duathlon Championships. The event comprises a 10K run then a 40K bike ride then a 5K run. Mick finished a staggering 19 minutes ahead of the silver medallist. Well done. The full results are here. Well done to the Hardley members who took part. We thought you might like to know how we both on got in our first London Marathon. Paul came home in a very good 4hrs 37 mins, Neil was on target to get home in 4 3/4 hrs until about mile 21 when his knee decided it could take no more and ended up limping home in 5hrs 27 mins. We both had an amazing and memorable day. So far we have managed to raise approx £2,250.00 for Help the Hospices. Thankyou to everyone who have so generously donated or sponsored us and we will update everyone again soon when all the monies have been totaled and finalised. You can read more on Neil & Paul's justgiving page. This popular race attracted 800 + entrants, knowing that this is a well organised event and a fast, flat course where personal best times can be achieved. Hours before the start, many phone calls were received by the organisers as heavy snow falls around the county made for difficult travel, not to mention underfoot running conditions. However the snow melted quickly, and it was bright and sunny for an 11am start. This years race was a Hants road race league event, with points at stake for the competing Hampshire teams. The race attracted some 27 Hardley runners. The men's veteran team of Kevin King, Malc Renyard, John Simmonds and Dale Purdom was the winning team. You can see the full results here. Some people will do anything to get out of running the Totton 10K in a bit of snow. Martin Loveless and Jeremy Barber went to Paris and enjoyed Spring weather for the marathon. Martin finished in 4087th place in 3.22 and an hour later Jeremy (who believes in getting value for money for the entry fee) was 20828th in 4.24. Worst value of all was the litre of beer Martin had to celebrate which set him back a whopping £16.40! Both are wondering whether to try Prague next year where the beer is a tenth of the price. Hardley Runners scooped the prizes at the British Championships, when our Vet60 team were 1st home. Malc Renyard captured the gold medal as 1st individual in his age group. The 4 lap, 8k course was flat uneven and muddy, being run over farmland. The tight turns proved difficult in the cold, wet and windy conditions. The team won the Southern cross country title a month earlier, so this wasa tremendous achievement for them and the club, having beaten big clubs from all parts of the country. The three man team to score comprised Malc Renyard, English Cross country international, Mick Anglim, current V60 Duathlon champion and Jack Hutchison: England orienteer. All proved a force to be reckoned with. The squad is made up with Dave Jewell and David Toft who keep the others on their toes. Another highly successful season, Hardley won both men’s and ladies’ leagues plus combined cup and in the individual leagues, Fionnuala Poynter won the ladies’ title (and vet 40) with Jane Morgan in overall 3rd place while in the men’s league Nick Newton came 3rd, Ian Banks 4th (while also winning the v40 title) and Mick Anglim won the v60 title. Congratulations to all those individual winners and well done to everyone who took part in this years league - 70 runners from Hardley competed in at least one race with Nick being the only Hardley runner who took part in all six. Overall, numbers of runners once again increased and for the first time we saw over 100 runners taking part in every fixture this season with 139 ladies and 191 men taking part in at least one race. Most runners (167) took part in the first race at Denny Wood and the lowest (100) competed at Manor Farm which I suspect had a lot to do with the clash of mothers day. Results for Hardley from last CC6 at Manor Farm plus details of all club members who have taken part in league this year are here and here is a photo gallery of the last race at Manor Farm . You can see all the results on the CC6 site (see links page). We also have an album of the first CC6 at Denny Wood on 21 October 2007. You can see the full results on the nationals site. The full results for the season are now available. All our teams stay in the same Division as they started which is a tribute to our members turning out to ensure that we have full teams. After the 5 league races the senior men managed to finish 7th in division 2 just avoiding relegation and the veteran men finished 6th in division 1. We were able to fiield a team at all these events. Well done. You can see the full results on the Hampshire Athletic site. Cross country action moved to another part of London on Sat 2 Feb for the South of England Master's Cross Country Championships. The hills and mud in Mad Bess Woods at Ruislip were not quite as tough as at Parliament Hill but the Hardley results were remarkable for such a small club. Hardley's Over 60 men beat scores of much bigger clubs from across the South to take Gold in the Team results over a three lap 10km course. Malc Renyard won individual Silver to lead Mick Anglim and Jack Hutchison to Hardley's first Team gold medals at this level. David Toft and Dave Jewell also scored highly in the O60 race and John Simmonds competed well in the O50 category. Jane Hodge represented the Hardley Ladies in the 6 km O45 race over 2 laps of the woods. Full results are not yet available.We'll publish a link when we get them. The course (15K for men and 8K for women) at Parliament Hill was undulating and muddy for the championships on 26 January.Our men were 57th and our women 32nd. There is a Hardley photo album here. Individual results were as follows. You can see the full results here. Note there are tabs at the bottom of the page to change between categories. Well done to everyone who represented Hardley in the above event on our tough Dibden Inclosure course. An even bigger thanks to the very small number of members who sacrificed their time to ensure that this prestigious event ran smoothly. The contents of this site are � Hardley Runners unless otherwise stated. Contact the webmaster if you have any problems or want to reproduce any material.